This blog was written by a fellow exercise therapist who owns The Egoscue Method of Austin. The x-rays are from my client who I worked with to help repair his knee. Great article Rick! A client went to one of our clinics for help with knee pain. 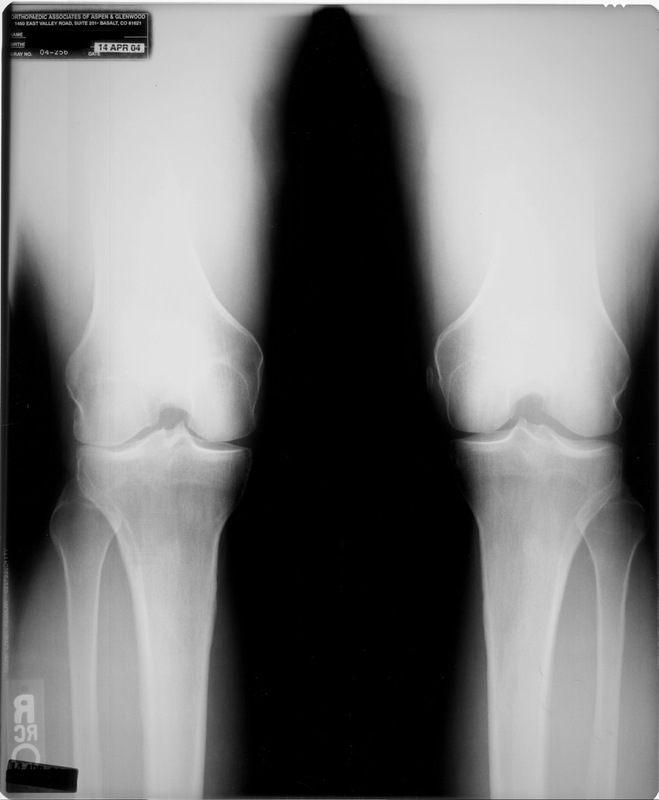 He had severe right knee pain and after getting xrays at an esteemed orthopedic clinic, he was told that he was bone on bone, that he had suffered severe cartilage loss and his only real option was a knee replacement. He found out about Egoscue and decided to “give Egoscue a try”. His knee quickly began to feel better and better to the point he was able to resume doing things he couldn’t previously do because of the knee pain. 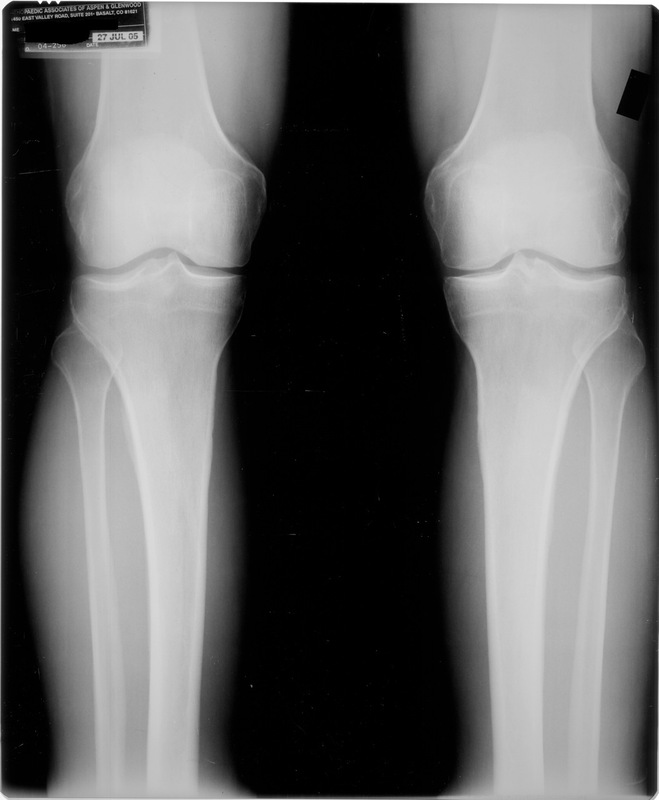 He then had to go back to the same clinic for another issue and while there they took a follow up xray of his knee. The first xray was taken in April of 2004, the second in July 2005, just over a year later. Well, after taking the second xray the doctor came in and asked the client what he’d been doing for the last year. The doctor said he was blown away, the knee was repositioned and the client was no longer bone on bone! He said he’d never seen anything like it! When I heard this story I contacted the client and through his therapist we obtained copies of his xrays, and now I have the privilege of sharing them with you. Here’s the first one. It’s a view looking at the knees from the front. Look at the outside edge of the right knee (the far left of what you’re looking at). See how the on the outside edge of the knee where the two bones (the femur and tibia) come together there is no space between the bones? That is the bone on bone condition where the cartilage has been worn away. You can see how the femur (the thighbone) is tilted or angled out to the side, which is what is pressing that part of the femur down into the tibia. This part of the knee had lost all cartilage and was generating tremendous friction with every step. Now, look at the second xray from July 2005! The femur is no longer angled, the outside edge of the knee is no longer being driven into the tibia and there is now spacing between the two bones. These xrays very clearly demonstrate you can have a knee that is bone on bone with severe cartilage loss and if you work on the position of the knee and don’t get hung up on the condition of it, great things can happen. Pete has been saying this for years and has seen many, many xrays like this but it’s the first time I’ve had ones to share publicly. The xrays are completely untouched and not altered in any way other than I’ve blacked out the name and birthdate of the client. Folks, believe in your body. Believe you CAN get better. If your doctor puts a label on you, realize it’s just a word and that if you get to work, great things can happen. I hope these xrays inspire you the way they’ve inspired me and all the clients to whom I’ve shown them. And I have a favor to ask from you. This is such important information,please send this link to your friends and family. Share this with as many people as you can. Help us get the word out about just how amazing the body really is. If you give it the right stimulus, you’ll be amazed at the results!